The participants settle in for an informative and inspiring day! We had a wonderful day on Friday at an Adopt a Monument Workshop and Networking Event with some of the Adopt a Monument Groups, County Council Community Archaeologists and the Heritage Council. This was an opportunity for Adopt a Monument groups to meet and share stories about their sites and experiences. As part of the event, we asked the groups to deliver a short informal presentation about their site, what they have achieved as part of the scheme and what their future plans are. The presentations outlined the story of the particular sites, why they applied to join Adopt a Monument, the group’s achievements and what they hope to accomplish in the future. The day began with Christina O’Connor of Waterford Community Archaeology: Gallows Hill, who told us about the incredible achievements to understand Gallows Hill, an Anglo-Norman motte surrounded by housing estates on the outskirts of the Waterford town of Dungarvan. The group have carried out geophysical surveys and excavations in order to better understand the site. 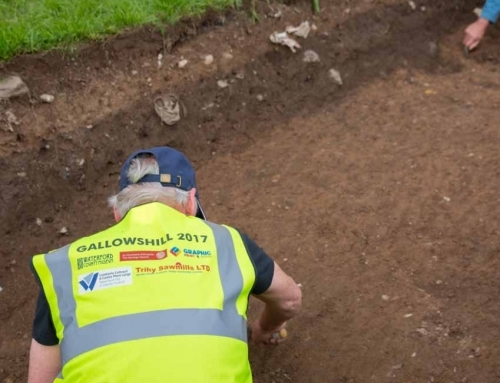 They have also really focused on engaging the local community with great Heritage Week events, fun medieval fairs and have had the Big Dig down to give local children chance to get hands on with archaeology. After Christina we heard from Paula Harvey of Donegal GAP Heritage and History Group. Paula described the groups efforts to understand and protect the spectacular Doon Fort. The fort’s location, surrounded by the waters of Loughadoon, may be spectacular – but it certainly makes access for conservation and study difficult. The community have worked incredibly hard over the last number of years, and they have commissioned conservation reports, expert vegetation management, geophysical surveys and photogrammetry to better understand the site. Pat Dunne of Glenmalure PURE Mile Group shared stories about their journey to restore the New Crusher House at Baravore. This important structure was part of the industrial heritage of the stunning Glenmalure Valley in County Wicklow. 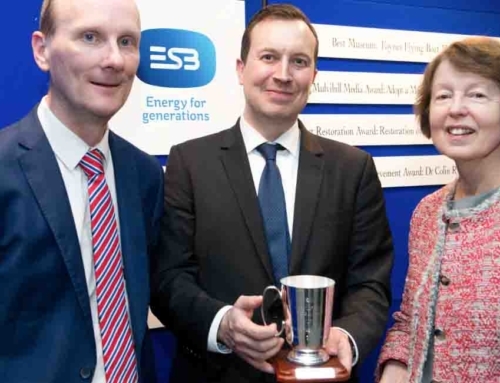 Pat discussed how, prior to joining Adopt a Monument, the building had been subject to littering, anti-social behaviour and it was in a precarious condition. 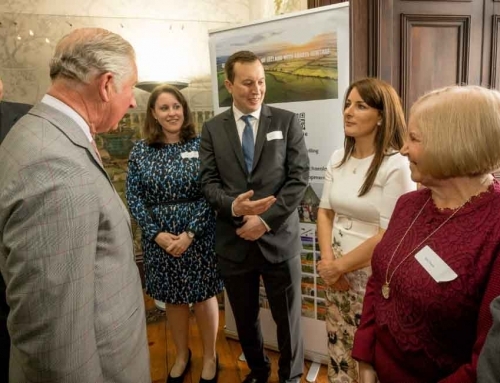 Now thanks to the efforts of the group, and their partnership with Wicklow County Council and the landowners Coillte, the building has been fully conserved and it should be safe for future generations. 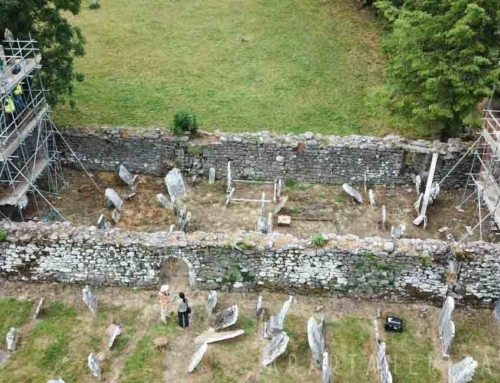 Following Pat, Dr. Nora White of the Ogham in 3D project discussed the efforts to protect and preserve the remarkable medieval church at Knockboy, Waterford by the Knockboy Church Conservation Group. 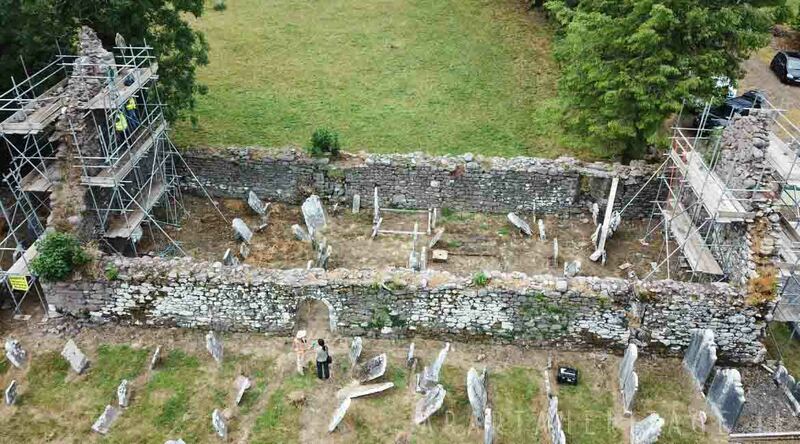 The church is highly significant as it contains a number of important ogham stones. The medieval church itself requires ongoing conservation work to help to stabilise and protect the structure. 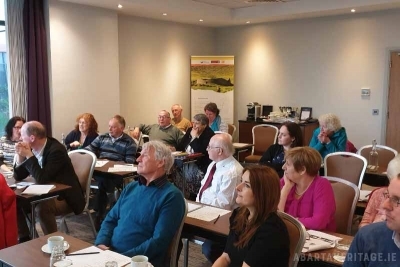 The group received expert advice and guidance in best practice from the National Monuments Service and funding from Waterford County Council and the Heritage Council. Conservation works have begun by the skilled mason Tom Pollard under the direction of conservation engineer James Powell. It is a painstaking and delicate job, but the local community have worked diligently to ensure this important site has a future. Anne Shanley and Chris Kirk of Killeshandra Tidy Towns discussed their efforts to conserve the Church of the Rath. It is from this church that the town takes its name. The Church of the Rath is a wonderfully atmospheric graveyard that has ancient origins. The church is one of the few Jacobean style churches remaining in Ireland and has national architectural importance. However, the brick vaults of the church have become severely weakened over the centuries. Thanks to a close partnership with Cavan County Council, a new roof is being put over the church to ensure that the building is safe. The last presentation of the day was by Christina Higgins of Mountbellew Heritage and Tourism Network who told us all of the efforts to restore the extensive walled garden of Mountbellew, Galway. 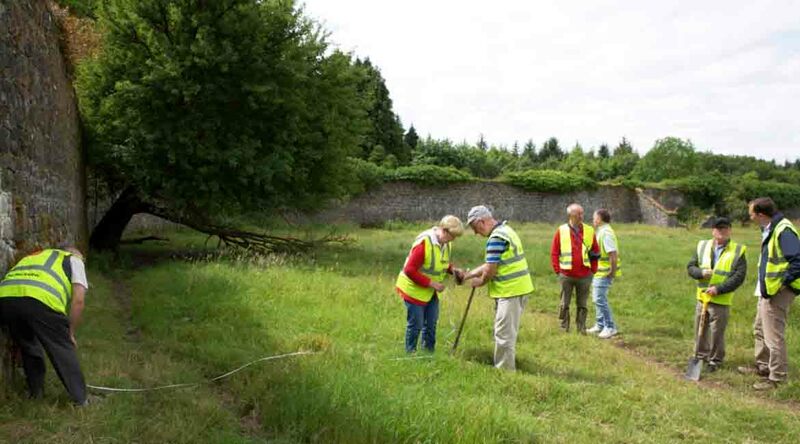 Through their efforts, with the help of Galway County Council and Coillte, conservation work has begun on the walls. The group has also been guided by the historic gardens expert Finola Reid, who gave guidance on best practice. 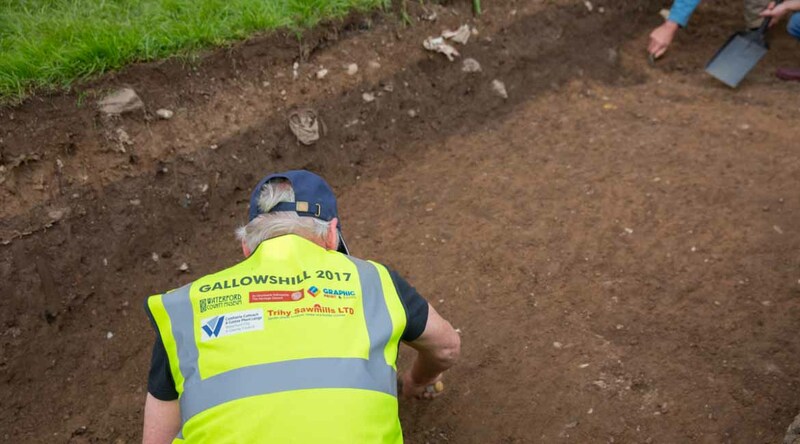 Galway Community Archaeologist Dr. Christy Cunniffe has been working with the group to uncover the original paths in the gardens. 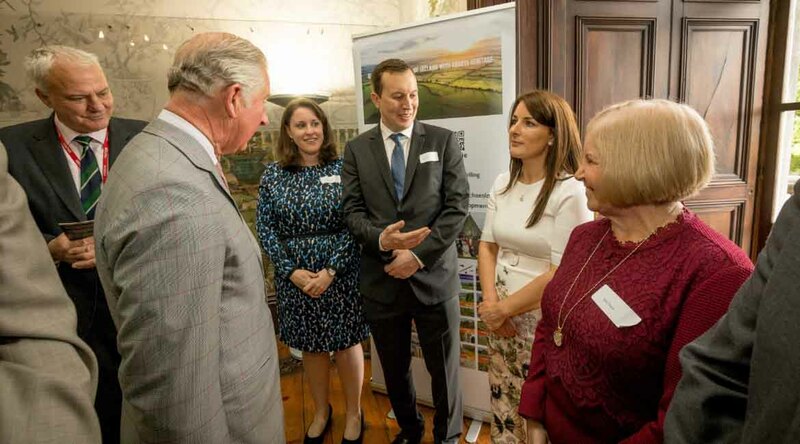 Some of the key themes that kept occurring throughout the day included the need to build strong partnerships with other stakeholders like the local authorities and landowners, the need to abide by best practice and most of all, that heritage projects take a long time, so you’re better to enjoy the journey rather than try to rush it all through! It was a really enjoyable day, and we hope to make it a regular event. Thank you to all the groups for their participation, and thank you to Ivor McElveen, Christine Baker, Tamlyn McHugh, Dr Christy Cunniffe and Siobhán Ryan for their insights. We are also grateful to Ian Doyle and the Heritage Council, and we hope that the Adopt a Monument Workshop becomes a regular event!